The iliotibial band is a thick tendon located in the outer leg, extending from the top of the hip bone to just below the knee. Iliotibial band (ITB) syndrome is a common source of knee pain, resulting from inflammation of the lower portions of the iliotibial band. Occasionally, inflammation can occur at the upper end of the iliotibial band, resulting in hip pain. This injury occurs mainly in runners and cyclists. It is caused by repetitive sliding of the band over the knee that leads to excessive friction acting on the band, irritation, and inflammation. This rubbing of the band against underlying structures is likely to occur when the knees are flexed about 20 to 30 degrees. Although it is an unusual injury in non-athletes, ITB syndrome has an incidence rate of 1.6 to 52% amongst athletes, depending on the population under investigation. It is the most common source of knee pain in runners and cyclists, accounting for 22% of all lower extremity injuries in the former and 15% of all overuse knee injuries in the latter. Although it is most commonly seen in the two aforementioned populations, athletes that participate in volleyball, tennis, soccer, skiing, weight lifting, field hockey, rowing and aerobics are also susceptible to the injury. Although the mechanism by which the injury occurs is well known, it is not well understood why some athletes are affected more than others. Usually, patients complain about a pain in the outer knee, which might radiate downwards or to the front of the knee. Oftentimes, the pain happens as one performs aggravating activities, but if injury isn’t severe, the pain may stop once activity has ended. Popping in the outer knee – the patient may also experience popping in the outer knee as they do the activities. Swelling at the lower end of the iliotibial band. ITB syndrome is often diagnosed clinically, and oftentimes additional diagnostic techniques are not necessary. A physical examination and thorough history are crucial in making an accurate diagnosis, especially the latter. ITB syndrome should be considered for patients that do not recall any trauma to the knees, take part in activities known to cause overuse injuries and report that rest has not been helpful in alleviating the pain. Patients usually complain of a pain in the outer knee region but cannot a specific area of tenderness in this region. This pain intensifies during activity as time passes, as the iliotibial band becomes more irritated. Pain is aggravated by downhill running, lengthening of the stride and sitting for prolonged periods of time with the knees bent. As for the physical examination, tenderness occurs when the outer knee is touched 2 centimetres above the joint line and when standing with the knees bent at about 30o. Strength in the muscle group that allows the knees to bend and straighten, and in the hip abductors should also be assessed as weakness may be an indication of ITB syndrome. If in doubt, a MRI may be utilized, especially in making a differential diagnosis to exclude other possible pathologies such as meniscal tears. The MRI may show a thickened iliotibial band, and may also reveal that the bursae, which is a sac that surrounds soft tissues and bones to provide cushioning, near the band has become inflamed and filled with excess fluid. Majority of patients recover well from non-surgical treatment, which usually consists of activity modification, treatment of the inflammation, a corrective phase and finally the gradual return to normal activities. Alleviation of the pain and reducing inflammation is the first stage of treatment, with ice, non-steroidal anti-inflammatory drugs (NSAIDs) and corticosteroidal injections being the most commonly used treatment options. The use of any of these measures to treat ITB syndrome, however, is not thoroughly studied and there are contradicting results from studies on the advantage of the use of anti-inflammatory agents in the treatment of such soft tissue injuries. Stretching of the iliotibial band and other muscles is also frequently prescribed after inflammation diminishes. Runners that have low mileage respond well to a regimen of stretching and anti-inflammatory drugs, but competitive or high-mileage runners need a more comprehensive treatment plan. Once stretching programme can be done without pain, a strengthening programme can be initiated. Return to running should be gradual and only done once stretching regimen can be performed without pain. For patients that do not respond well to conservative treatment, surgery should be considered. MedlinePlus. (2015) Iliotibial band syndrome – aftercare. 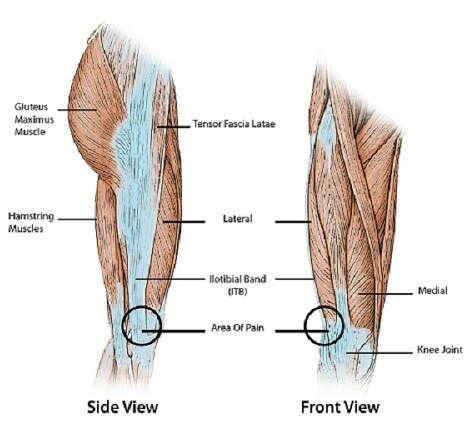 Lavine, R. (2010) Iliotibial band friction syndrome, Curr Rev Musculoskelet Med 3, 18-22. Khaund, R., and Flynn, S. H. (2005) Iliotibial band syndrome: a common source of knee pain, Am Fam Physician 71, 1545-1550. Practice, B. B. (2015) Iliotibial Band Syndrome: Epidemiology. Beals, C., and Flanigan, D. (2013) A Review of Treatments for Iliotibial Band Syndrome in the Athletic Population, J Sports Med (Hindawi Publ Corp) 2013, 367169. Fredericson, M., and Wolf, C. (2005) Iliotibial band syndrome in runners: innovations in treatment, Sports Med 35, 451-459.